Beer Braised Beef Enchiladas - Home. Made. Interest. This is a sponsored post written by me on behalf of Mission®. All opinions are entirely my own. 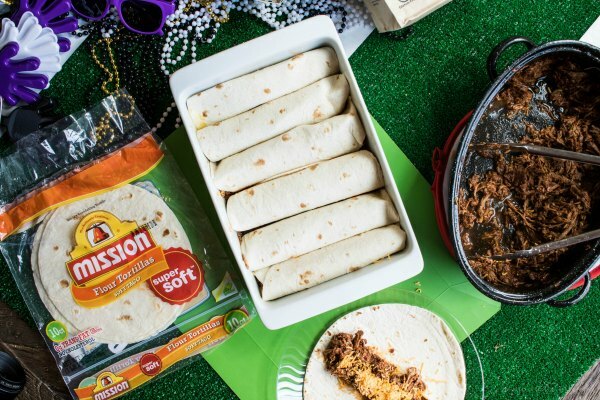 These Beer Braised Beef Enchiladas are a great way to feed a hungry crowd for the big game party! Are you guys as excited as I am about the playoffs?! My whole family is a bunch of football fanatics. I don’t get to tailgate as much now that I have little ones but we do a lot of homegating during football season. 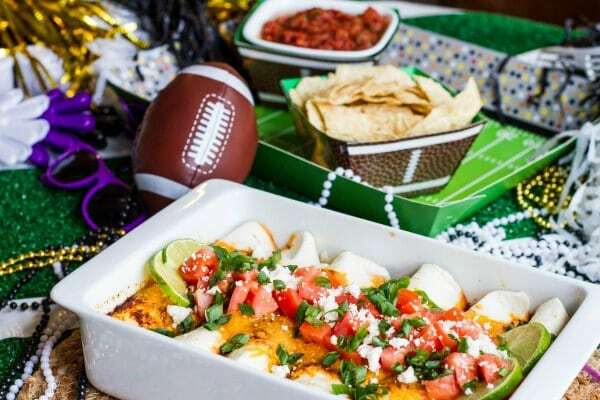 I think I may love all of the amazing football party food even more than the game…maybe. 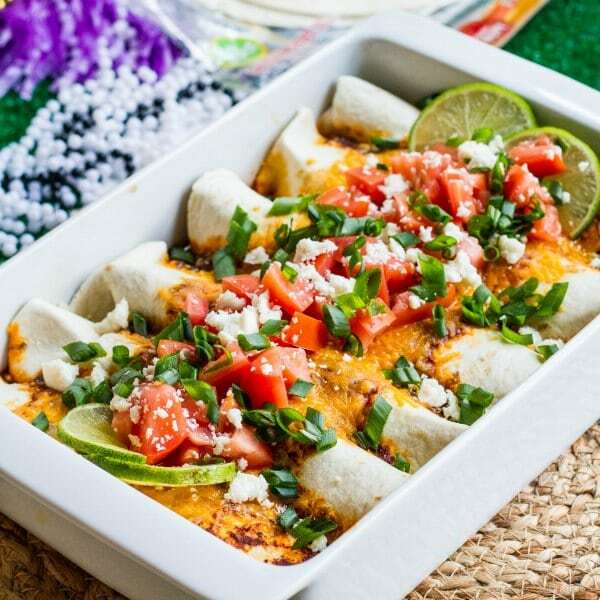 One of my favorite easy recipes for feeding a crowd is a big batch of beef enchiladas and this year, I am making Beer Braised Beef Enchiladas. These beef enchiladas are hearty, comfort food wrapped up in delicious flour tortillas and covered in a flavorful red sauce. 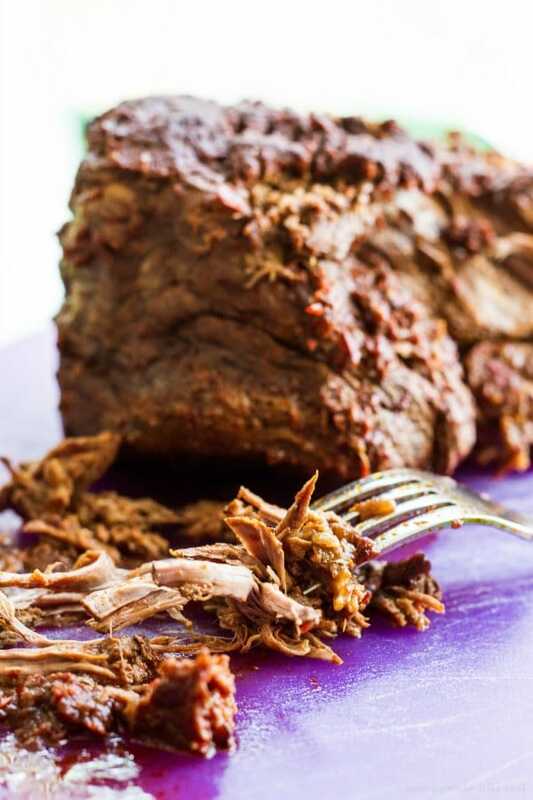 To give my enchiladas a little bit of Maryland flavor, I braised my beef in National Bohemian Beer, or as we lovingly call it here in Maryland, Natty Boh. It’s a Baltimore beer that has been brewed here since 1885 and it added just the right flavor to the red sauce I braised my beef in. Beer helps tenderize the meat too, so my roast shredded easily into tender strands of beef that I stuffed inside of Mission® Super Soft Flour Tortillas. To make my red sauce, I pureed guajillo and ancho peppers together with chipotle in adobo sauce, spices, a little cinnamon, and brown sugar. Then I added my Natty Boh Beer (you can use any Pilsner beer, if you don’t have Natty Boh) and poured it over a chuck roast and braised it for 2 1/2 hours. When that tender beer braised meat came out of the oven, I shredded it and placed it in a Mission Super Soft Flour Tortilla along with a quarter cup of shredded cheddar cheese. Mission Super Soft Flour Tortillas are great in all sorts of recipes. They are soft, delicious, and the perfect size for my enchiladas! The tortillas should be prepared warm for the best, full flavor. They are so easy to use with any dish. I rolled my beef and cheese filling in them and then poured a little more of that amazing red sauce over the wrapped tortillas before popping them in the oven. 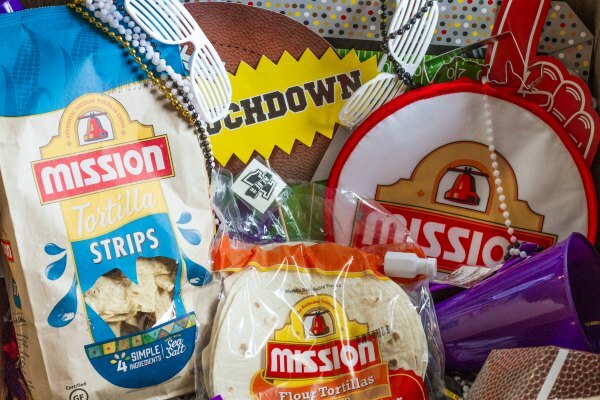 Enter HERE to win a Game Day Party Kit from Mission! Planning on watching the Big Game with friends and family? Enter for a chance to win a party kit from Mission. It will have all sorts of goodies to help you throw a homegating party to remember. You can celebrate the Big Game and cheer for your team by visiting MissionPartyKit.com between 1/1 and 2/4. Prizes may include a Roku® Streaming Stick®, party decorations, and a recipe card for your favorite team. The Grand Prize winner could also receive a 70 inch 4K TV! Visit the Mission Party Kit site for more info! NO PURCHASE NECESSARY. PURCHASE WON’T INCREASE CHANCES OF WINNING. Open to 50 US states/DC residents, age of majority (age 19 in AL & NE/ age 21 in MS/age 18 in all other states and DC) or older. Enter at www.MissionPartyKit.com. One entry/calendar day. Sweepstakes begins 12:00:01 a.m. ET on 1/1/18 and ends 11:59:49 p.m. ET on 2/4/18. For prizes, odds & official rules, go to www.MissionPartyKit.com. You can’t have a party without chips! 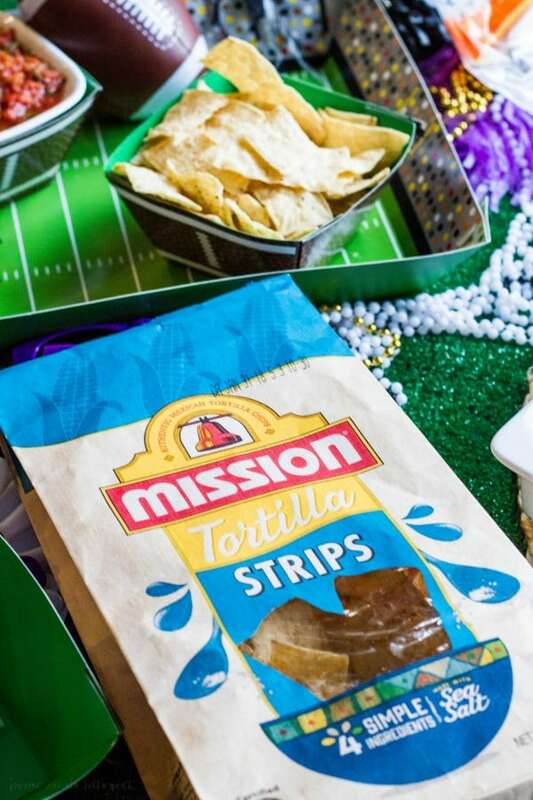 Mission Tortilla Chip Strips make a great addition to any game day party and they go perfectly with beef enchiladas. They are certified gluten-free and they only have four simple ingredients and sea salt. They are simple and delicious. Put them on your table with a big bowl of fresh salsa and you’ll be lucky if there are any left at half time! When the beef enchiladas come out of the oven they smell AMAZING! I topped mine with diced tomatoes, green onions, queso blanco and cilantro but you can customize your toppings however you like. The Mission Super Soft Flour Tortillas soak up that red sauce and the meat is so tender and juicy it melts in your mouth. 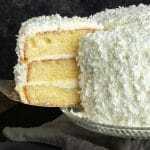 It’s the perfect easy recipe for feeding a crowd of hungry football fans!! 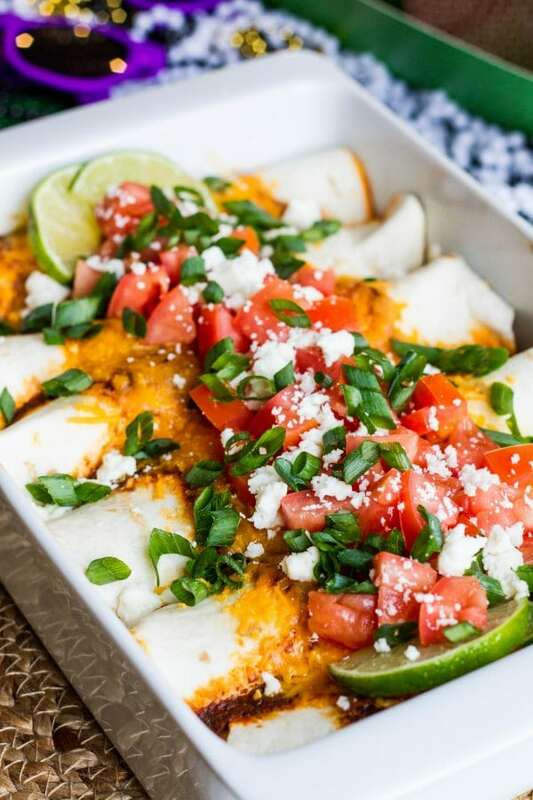 These easy beer braised beef enchiladas as tender beef barbacoa cooked in a flavorful sauce and cooked inside flour tortillas topped with sauce and cheese. Soak the dried guajillo peppers and ancho peppers in a bowl covered with water for 1 to 4 hours until softened. Season the beef with salt and pepper. Add the olive oil to a dutch oven or large pan with a oven proof lid. Heat oil on medium to high heat. Sear the seasoned beef for 2 mins on each side. Set aside once seared. In a blender, add in guajillo peppers, ancho peppers, can of chipotle, garlic cloves, brown sugar, salt, oregano, cinnamon, and beer. Pour sauce over beef in the pan. Place the lid on and braise in oven for 2 1/2 hours. Remove 1 cup of sauce and set aside for enchiladas. Return shredded beef to pan and stir into the remainder of the sauce. Grease a 9x13 baking dish. Pour ¼ cup of the reserved sauce in the bottom of the baking dish. To each tortilla add shredded beef (about ½ cup) and a small handful of cheddar cheese (about ¼ cup). Wrap tortillas tightly around filling, placing seam side down in baking dish. Pour remaining sauce on top of the enchiladas and sprinkle the remaining cheddar cheese down the middle. Nutrition Disclaimer: We are not certified nutritionists. Nutrition facts are an estimate and are provided as a courtesy. They are generated by an online API which recognizes ingredient names and amounts and makes calculations based on the serving size. Results may vary. No matter who you’re cheering for this year make sure you ENTER TO WIN your own www.MissionPartyKit.com and do a little homegating while you enjoy the Big Game! Kat & Melinda are best friends who love to get together and create something awesome. They started having craft nights a few years ago, so they decided to start a blog to share their creations. Sometimes they succeed, sometimes they fail, but they always have fun! ©2019 Home. Made. Interest. Design by Purr.